The private sector has contributed just 2% to flood defences in England, or £37m, despite government efforts to attract such investment as a new source of funding. The revelation will add pressure to ministers already under fire for cuts to flood defence budgets and the Environment Agency. Environment secretary Owen Paterson has been criticised after weeks of severe storms caused widespread flooding and ministers recently had to admit their claims to be spending more than ever before on flood defences were incorrect. Annual spending will fall by 15% in real termsunder the coalition. Ministers said earlier in January that £148m of partnership funding had been obtained. 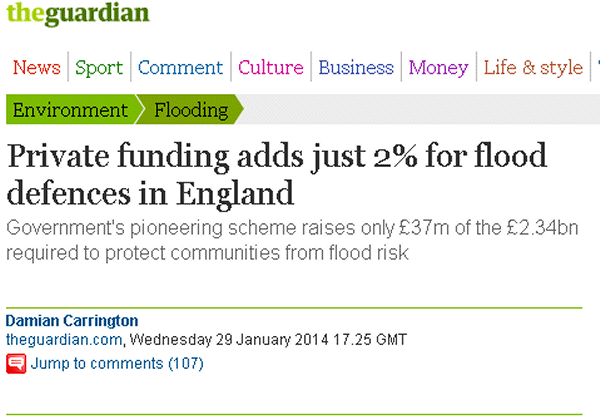 But the Guardian has learned that only 25% – £37m – is coming from private sector sources, from developers or companies who will benefit from the better flood protection of at-risk land. The rest is coming from local authorities, despite their budgets also having been heavily cut by the coalition. The total spend from 2011-2015 will be £2.34bn, making the £37m private sector funding less than 2% of the total. Furthermore, flooding minister Dan Rogerson acknowledged that only£67.6m of the partnership funding had been delivered by the end of 2013. Cameron addressed the extreme flooding of the low-lying Somerset Levels in parliament on Wednesday. He said dredging would begin as soon as possible, although the Environment Agency has said it was “often not the best long-term or economic solution”. Cameron appeared to overrule Paterson who, after being heckled by flooded-out homeowners in the Levels on Monday, had announced a six-week review. The government’s emergency Cobra committee met again on Wednesday to address flooding and has now met over 10 times since early December. Government scientists have identified rising flood risk as the greatest impact of climate change in the UK.